Perfect combo of almond and chocolate. 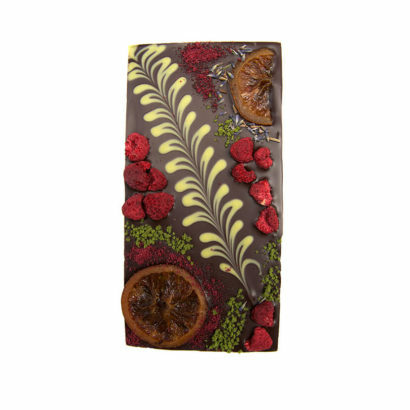 organic and fair trade chocolate (cocoa paste, cocoa butter, vegan sugar, soy lecithin, vanilla), organic almonds, smoked sea salt. One of the weirdest things for me is to make things I wouldn’t personally buy. I want to buy bizarre things like onion and eggplant truffles and candies based on recipes from the 1800s. I am, obviously, demonstrably weird, and if we only made what I’d buy, the shop would be limping along. So we’re listening to not only our own hearts, but also to you. 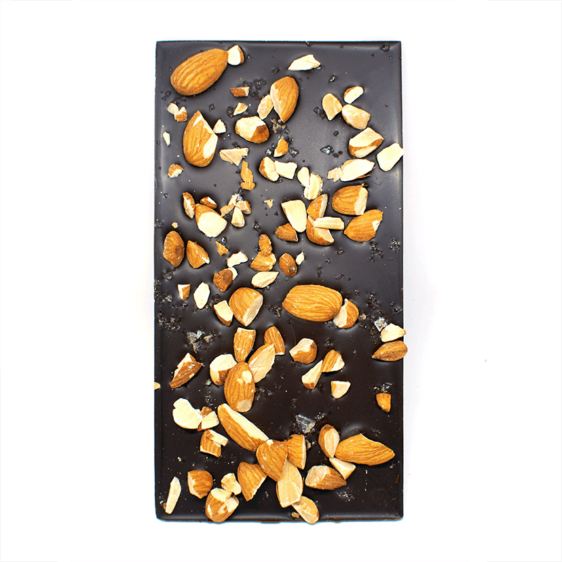 And what New Paltzians want—what they ask for every day in our shop—is dark chocolate + almonds. We get so many requests for this combination! Herewith, we live to serve: a thin dark chocolate slate with roasty-toasty almonds plus a smattering of cypress hardwood smoked sea salt (couldn’t resist!). And you know what? It’s so good, I’d buy it too! 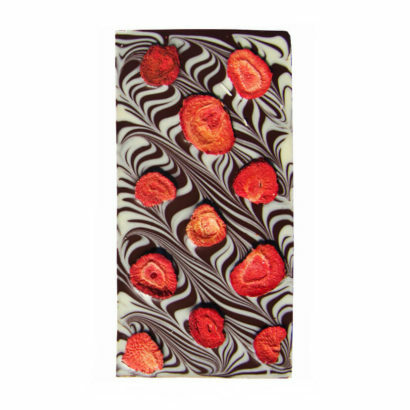 This very thin slab of chocolate is about half as thick as our other barks. It’s not overwhelmingly salty, you just get a nice pop of crunchy lightly smoked sea salt now and then. 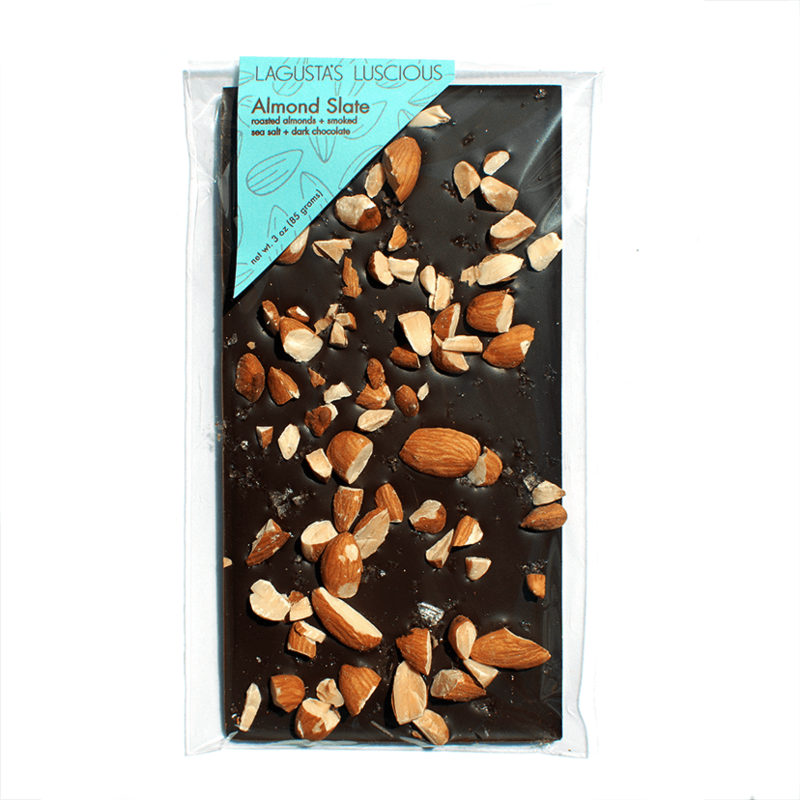 It’s absolutely slathered with deeply, freshly toasted organic almonds. 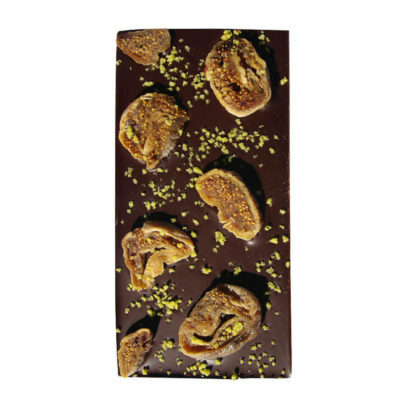 Because it’s a solid chocolate it will last weeks (truthfully, months) at cool room temperature, although anything with nuts is always best eaten as fresh as possible.